This 26-episode series brings stories from different walks of life. Amma Superstar highlights different relationship bonds that showcase the mother like love and comfort through food. Amma Superstar has individuals participating in pairs like friends, caretakers, roommates in the hostel and neighbors apart from only mothers and children. Following a fun and interactive format the participants in the show are seen participating in games such as food quizzes, rapid fires, picking the odd one out and true or false. The participants will be seen recreating their Amma's special recipe and sharing memories and anecdotes around food. 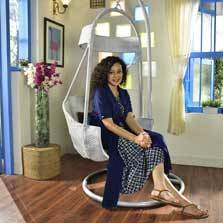 Chef Pallavi creates recipes that remind her of similar memories as those featured in the episode. The show will witness celebrity participants such as celebrated Chef Saransh Goila,actress Amrita Prakash from the show Shakti - Astitva Ke Ehsaas Ki and popular television and theatre actor Rytasha Rathod best known for her role as Badho in the show Badho Bahu. Chef Saransh Goila will be seen alongside his mom on television for the very first time. Interacting with Chef Pallavi sharing how the famous Goila Butter Chicken was created and the special twist that makes it what it is. Tune in to Living Foodz every Tuesday and Wednesday at 2:30pm, starting July 10, 2018. The show is sponsored by Freshwrap, Wonderchef, Tata Sampann and Preet Lite.